eople just love conspiracy theories don’t they? Once identified, groups bubble up to protest, report, stir-up controversy, and shout from the mountain tops all about the newly discovered unknown CoNsPiRaCy! Oh, and now the new 5G wireless network will cause cancer and cook people alive. Oh, but of course it will. We’ve been here before haven’t we? I think it was almost 25 years ago when cell phones first came out and everyone was supposed to get cancer then. Whelp, people are getting cancer all the time, but there are a plethora of ways for that to happen beyond low-level electromagnetic fields caused by wireless phones. 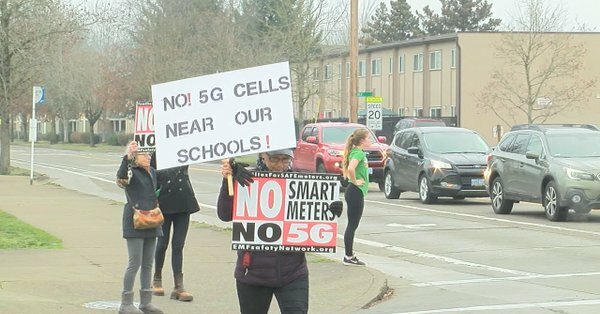 Groups are already picketing the not even rolled out new 5G network by targeting new towers being erected in Oregon. Moreover, of course the content starved fake newsers jump on the bandwagon to tout stories and report the protesters with their TriField Meters which they recently purchased which they think act like a Geiger meter. When the World Health Organization says there is no evidence that there is any health risk from low-level electromagnetic fields, what would be their reason to lie? WHO doesn’t sell cell phones. Everyone wants to be Erin Brockovich. It’s a noble crusade. However, a good conspiracy is just not as readily available as many want to believe. They aren’t as easy to conceal these days. Oh, and sorry to break it to anyone, but there is no Bigfoot, aliens haven’t been here yet, and no one has photographed a ghost.